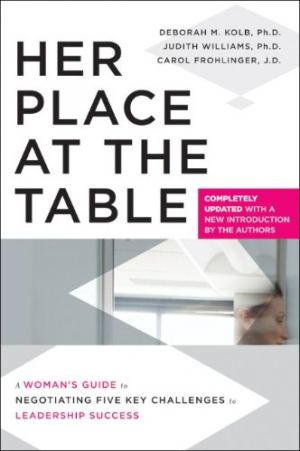 Her Place at the Table, as its subtitle suggests, offers women a guide to leadership success in the modern work environment. Each of the “five key challenges” forms a chapter. The first challenge is drilling deep, gathering the information needed when deciding whether to take on a new job or project, or when negotiating the circumstances under which you take on a new job or project. The second challenge is mobilizing backers, building a support network and setting the rules of engagement that every good leader needs. The third challenge is garnering resources to ensure you have the tools you need every step of the way. The fourth challenge is bringing people on board and overcoming the inevitable resistance to change. The fifth and final challenge is making a difference, which may mean actually changing things, or giving yourself credit and taking credit for what you’ve accomplished. Although designed a bit like a self-help book or how-to manual, Her Place at the Table avoids many of the normal pitfalls associated with these genres. Most self-help books and how-to manuals present a world that’s just a bit too rosy. Everything’s easy. You’re perfect and wonderful. The world is your oyster. All you have to do to succeed is ask the universe to give your perfectly wonderful self what you desperately want and truly deserve. All stuff, fluff and nonsense. Her Place at the Table, on the other hand, engages with the world as it is and deals honestly with the internal and external obstacles that women face in the workplace. From the introduction through all five chapters, the authors detail the myths and misconceptions that hamper women’s progress in our careers and give detailed strategies on how these challenges can be overcome, including specific examples from real women who have overcome these challenges to succeed in their own careers. Some of the strategies detailed in the book may be out of reach for women just starting their careers, or may not work for every individual situation. However, the advice is generally realistic and practical. I found myself wishing I’d read the book long ago, perhaps before encountering some of the traps the authors tackle. Now that I have read it, I intend to revisit it often and to recommend it to as many women as possible, starting with you. Go. Read.